Gorgeous color palette ceramic Bitossi jar Signed on the bottom. Like a Fellini movie, the ceramics of this famed Italian company embody a creative spectrum that ranges from the playful and earthy to the high-minded and provocative. Based in Florence, Bitossi Ceramiche draws on craft traditions that date back to the 1500s. These find expression in the artisanal vases and animal figures by the firm’s longtime art director Aldo Londi, as well as the colorful, totemic vessels designed by the high priest of postmodernism, Ettore Sottsass. But with his other hand, Londi reached out to thoughtful, experimental designers such as Sottsass. Starting in the 1950s, some 20 years before he founded the Memphis postmodern design collective in Milan, Sottsass used the Bitossi kilns to create timeless works that manifest both primitive forms and modern geometries. In later decades, Bitossi would welcome new generations of designers, which have included such names as Ginevra Bocini and Karim Rashid. While always looking forward, Bitossi is firm in their belief that mastery of craft is the first step towards beautiful design. As you will see from the works offered on these pages, that is a winning philosophy. Original signed marble bowl by Angelo Mangiarotti. Stunning floating shape in creamy marble. Incredible pair of marble vessels by Angelo Mangiarotti. Signature cone shaped base with circular bowl resting on top. Perfect for planter / statement piece. Gorgeous ceramic tile coffee table by Tue Poulsen for Haslev Danish Modern. Wonderful color and texture to the tile work and table is hand signed. Rare to find in USA. Mid-Century Modern Italian Bitossi for Rosenthal ceramic vase, made in the 1940s in Italy. The piece has its original label and is in very good condition. Possibly unique with its enormous 32" height and spare modern glyph glaze decoration. Attributed to ceramicist Aldo Londi. Signed and labeled to underside. Distributed by Raymor. 1950s glazed ceramic and volcanic ash "Thailandia" vase by Aldo Londi for Bitossi, imported to the US by Raymor. 2 vases available, shown in the last image. 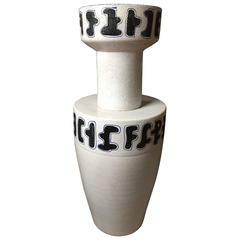 Bitossi vase ceramic signed. 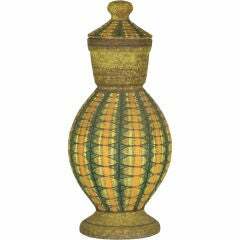 Medium scale ceramic vase decorated with horizontal and vertical hash marks in red green blue yellow over white glaze. Signed V 339/3c Italy. 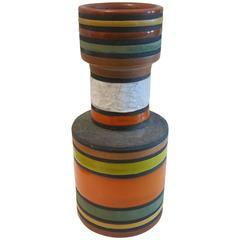 Offered is a fabulous, 1960s, Italian, Aldo Londi, Bitossi for Raymor, glazed ceramic vase. The piece has beautiful shades of orange, brown, yellow, and green. Signed on underside.